Even though the Three Birdies often work together to come up with projects and posts for this blog, from time to time one of us will do something that totally inspires the other two! Case in point: the Ribbon Jar post. After Stacy came up with her darling jar, Jessica and I both went to work on our own stashes. I even made a storage jar for some buttons I was giving as a gift to a friend. So even though we already shared this idea, I couldn't help sharing the pics of what that post inspired. Think of it as Ribbon Jar: Part 2. Enjoy! Jess took Stacy's post as a major challenge to clean up her ribbon box. Holy ribbon, Batman! Look how cute her little clothespins look so far! Adorable. I raided my canning jar collection and organized my ribbon by color, tying a sample on the outside of the jar (mostly for the cuteness factor). I also included a small jar for Christmas ribbons since I got a few from my Secret Santa this year (thank you very much!). Here are a few examples. . . I am in looooove with this vintage Mason jar. I found it at an antique store--the friend I gave it to loves antiques and scrapbooking. Perfect combo, n'est pas? 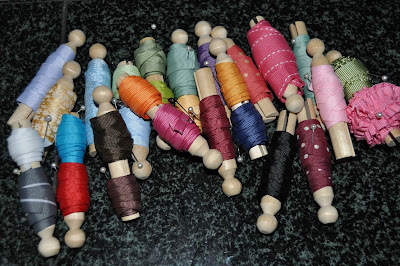 Someday when I have my own real craft room I want a whole shelf of these, each with a different color of buttons. Dreamy. . . Need other ribbon storage ideas? Check out this post. Watch for more craft organization tips soon--we know you're all making the same resolutions we are! Those are SO CUTE! I have done something similar but with my seashells. I seem to use a lot of them when decorating for color and texture, and I store my leftovers in clear jars in my craft closet. What a wonderful way to keep your tapes, I love the idea, now just need much room to store so much better looking, my house is very small. But I keep in case I ever have my corner. OH yes that is a dream of mine too. A whole wall with bookcases with jars, filled with color. Buttons, ribbon and what nots, lol. Hugs and thanks for all the cute and great ideas. These look so pretty - great idea! that canning jar is fabulous! I've never seen one like it with a quilted design before! WOW! I love the jar idea! I can't wait to move in 3 years and have my craft room back. I would love to do something like this!!! I love these ideas! And I have tons of jars so I'm totally doing this. I'm linking this post to my blog. Thanks so much! I am truly inspired by your blog. That's awesome! You three are the best team! Can't wait to meet you when I'm in Seattle next (this spring). I love the ribbon jar idea. 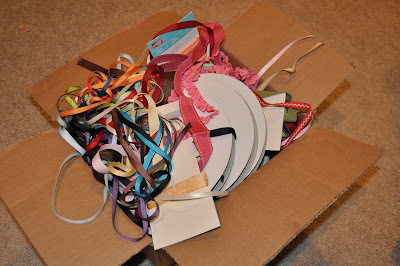 I have ribbon in all sizes shapes and colors: some on rolls, some just pieces. That way you can see it easily and it is a cute storage idea to. I could see them lined up on a low shelf, within easy reach. Thanks. Great ideas! My ribbon is quite out of control too. what great ideas to pretty things up! just discovered your adorable and inspiring blog!!! 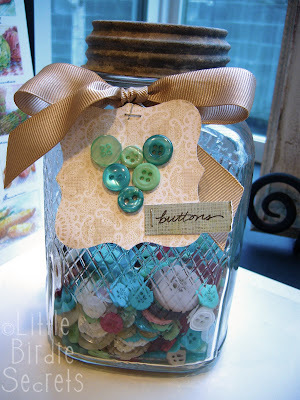 I love, love, love the ribbon jar idea. Currently, I have a storage box (shoe size) of all my buttons mixed in together. I am wanting to sort them out and I am going to use this idea to do just that. About the clothes pins.... you might try Dollar Tree. I have seen some there before. Too cute! I've got a huge jar full of thread. But now I guess I *need* more ribbon! I love this jar! Very cute! I LOVE the ribbons in a jar. I just got some vintage jars from my MIL and a sweet reader sent me some wooden spools to put in 2 of them. Next up might have to be ribbon. I love the idea of buttons too! I'm in the gearing up, thinking stage (a loooong stage for me) for a turn-the-unbelievably cluttered-downright disgusting-laundry-room-into-a-beautiful-craft-space project and am very inspired by your ideas! Thanks! Now I'm inspired! And such a nice way to use all those old Mason jars. i love love LOVE those clothespins! where can i get some?